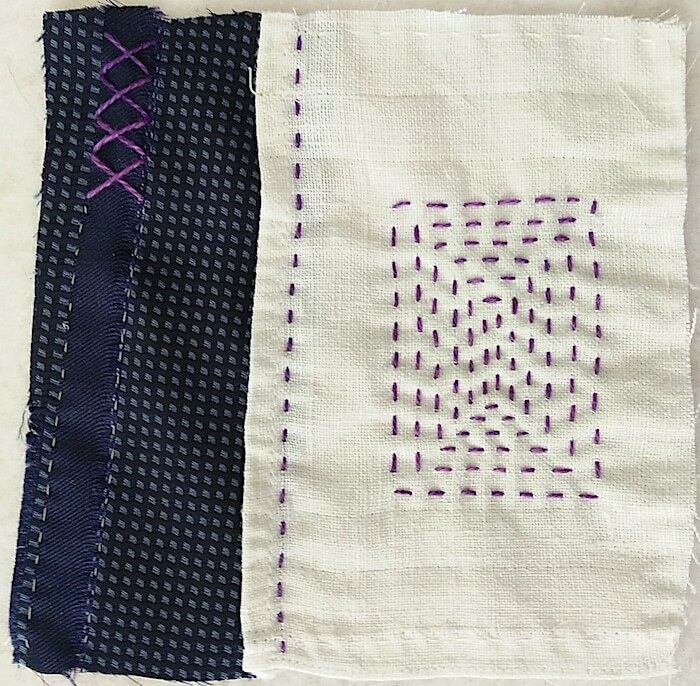 There are many reasons for stitching mindfully and more importantly when this is going to happen. 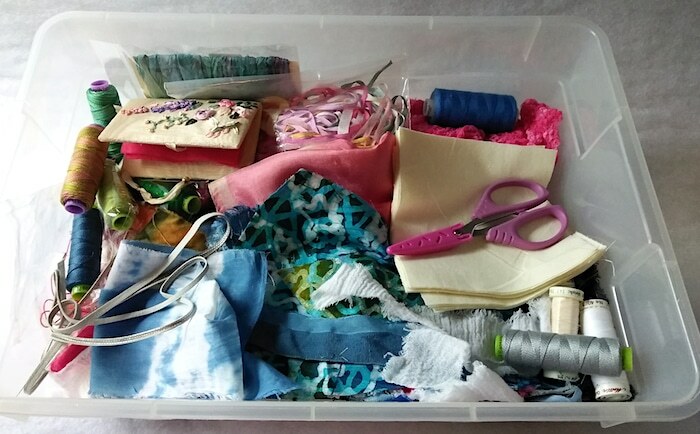 I was asked if I had planned when I was going to practice my stitch meditation. 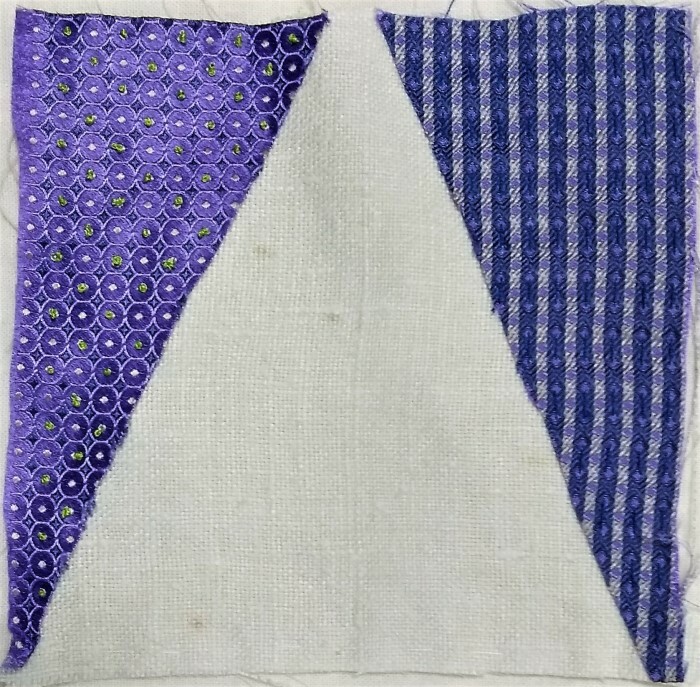 My plan was to stitch two evenings during the week – Tuesday and Friday nights. This is already a change from the response I gave the person asking! It’s important to be flexible in your practice. Life happens and you can easily and without guilt make accommodations. 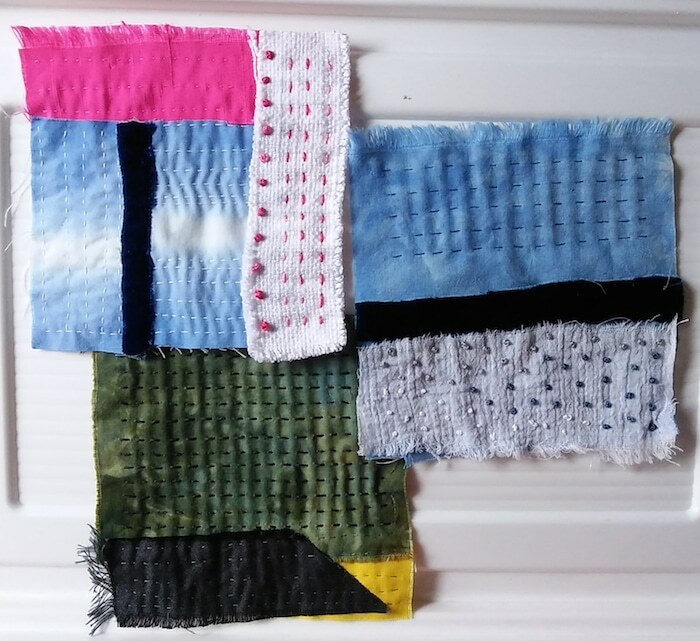 Linda McLaughlin has been creating daily and weekly stitch meditations since 2012. 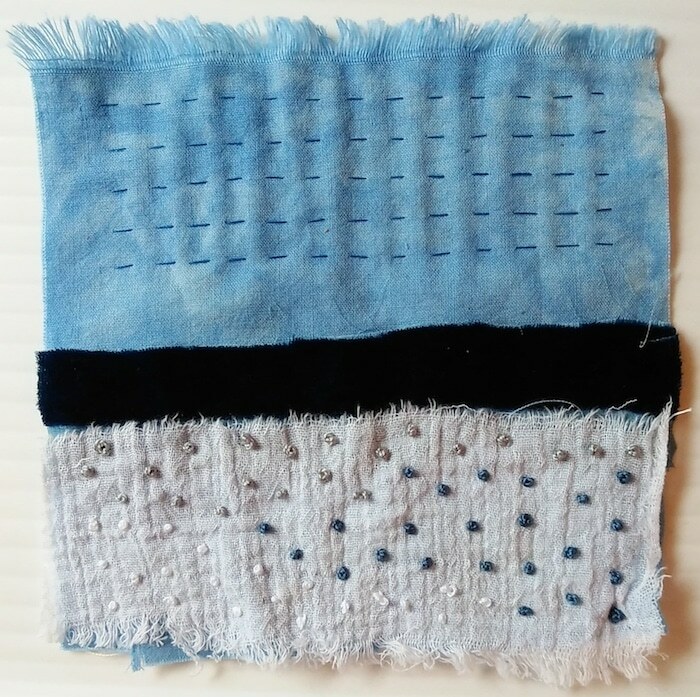 Linda was already taking photographs daily and posting them online when she read a few blogs about daily stitching projects. She began because she wanted to see if she could commit to creating daily. Linda found she enjoyed having something waiting for her in her studio every day. Interestingly, Linda doesn’t always start her projects at the beginning of the year, they feel too much like resolutions which she fails at! 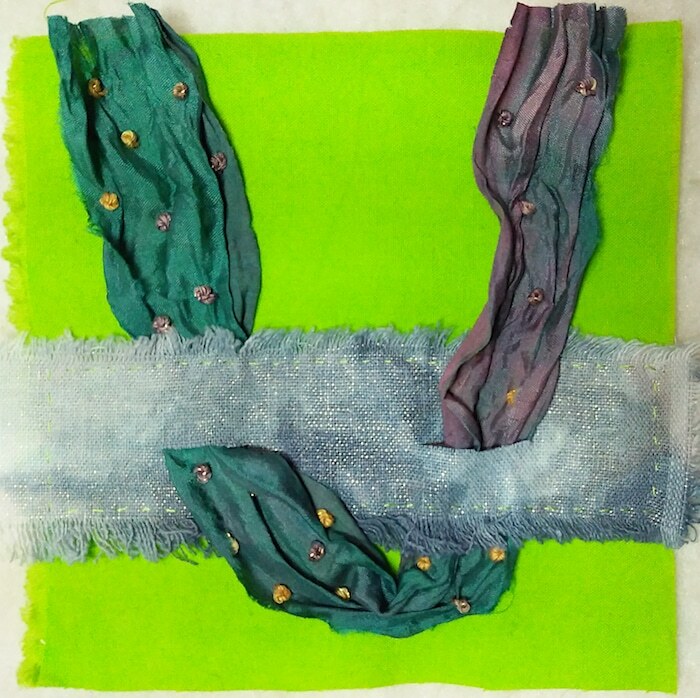 Linda blogs about her progress at Linda McLaughlin: Notes from Studio B.
Linda begin her weekly leaf project in January 2014 and has continued to explore this theme. Linda has used leaves in several of her projects. 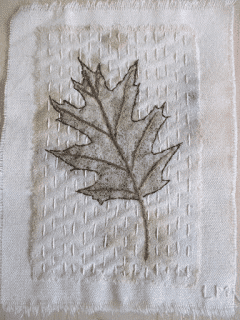 In 2018 she began her stitch meditations with eco printed leaves on silk, attaching these to canvas and added embroidery stitches. She did not know what she would do with them when the project was completed. One thought is to attach them together to make an accordion pleated book. Linda has multiple projects on the go and is amazed at what she accomplishes even when spending as little as ten minutes a day on a project. 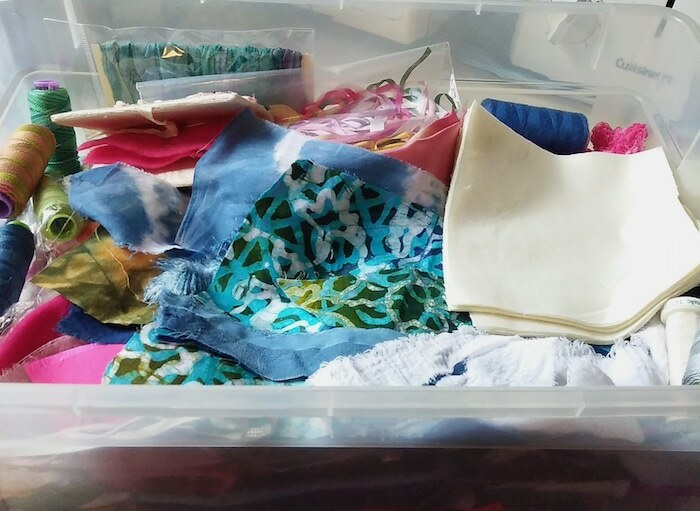 Being organized and preparing the fabrics, threads, tools ahead of time are key. 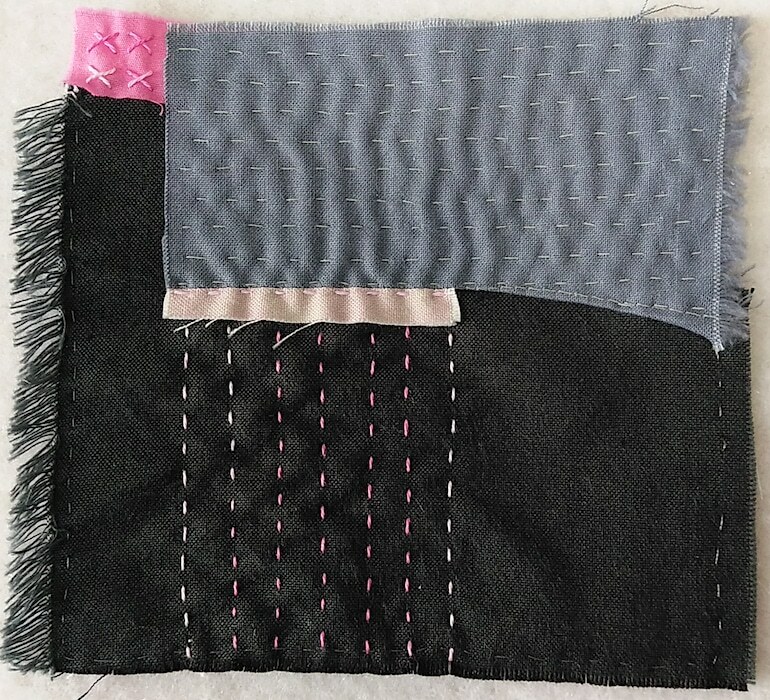 Linda has made it portable taking her stitch mediations to Europe, China, Canada and all around the US! I think I’m most proud of the fact that I’ve stuck with it for so long and still love doing it. This will be my seventh year! 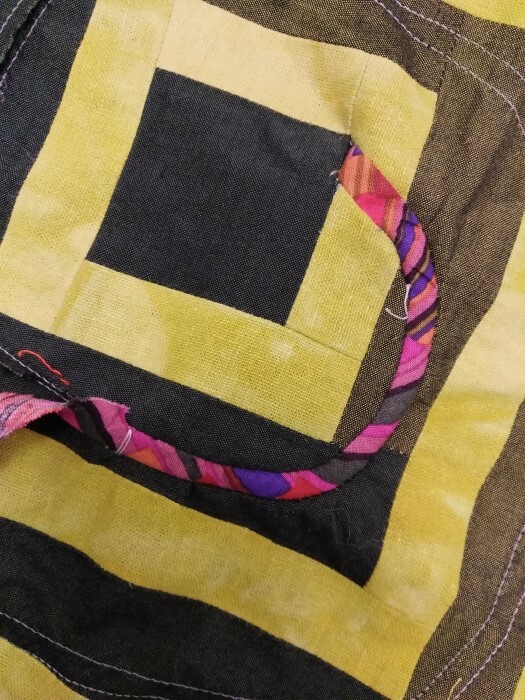 I’m also a bit surprised about some of the things that have happened because of daily stitching, like being invited to do Quilting Arts TV back in 2013, and also doing some talks for guilds and ladies groups. Linda also says not to “expect perfection if you are trying something new, the more you do it the better you get”. 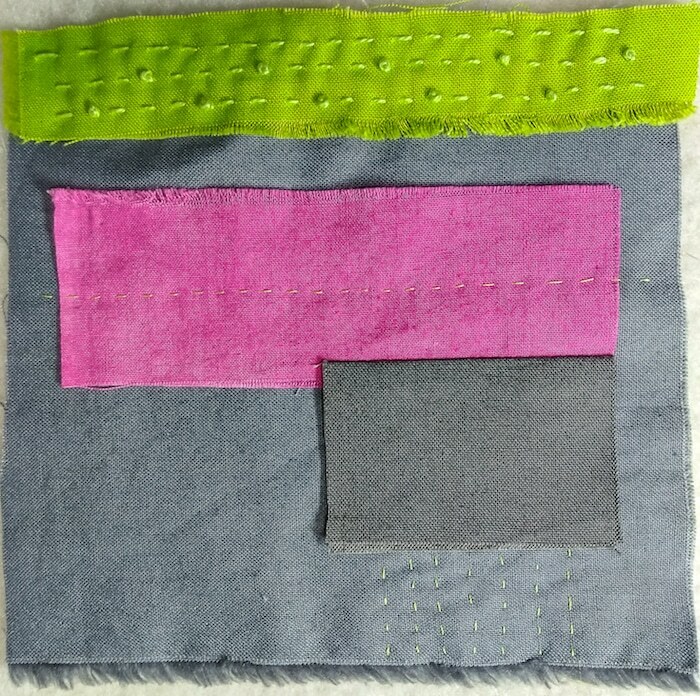 So I encourage you to try a new thread, stitch, colour combination and keep practicing – one stitch at a time. 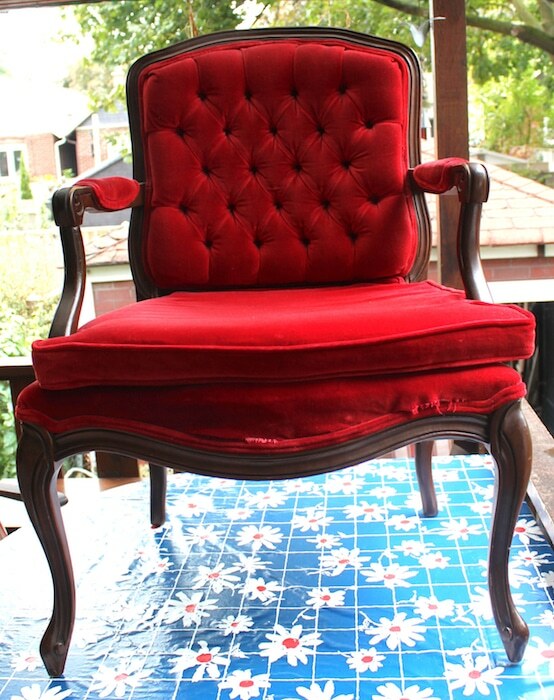 The plan was to remove the red velvet, reconfigure the seat, change the tufted back and paint the wood frame. 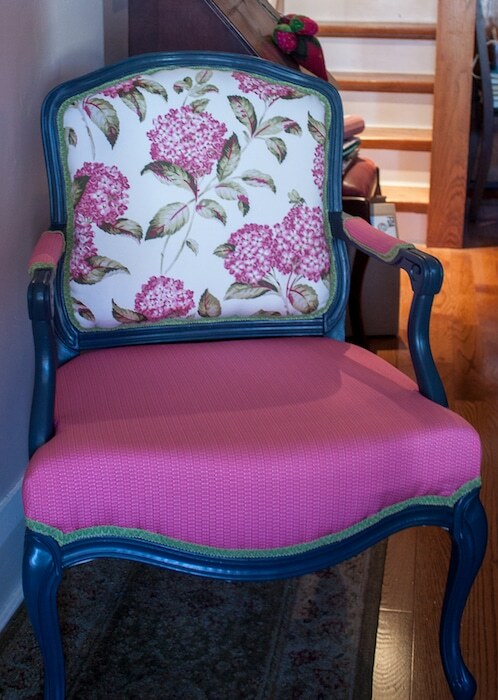 The french provincial style and the new feminine fabrics would be perfect for her dressing room. 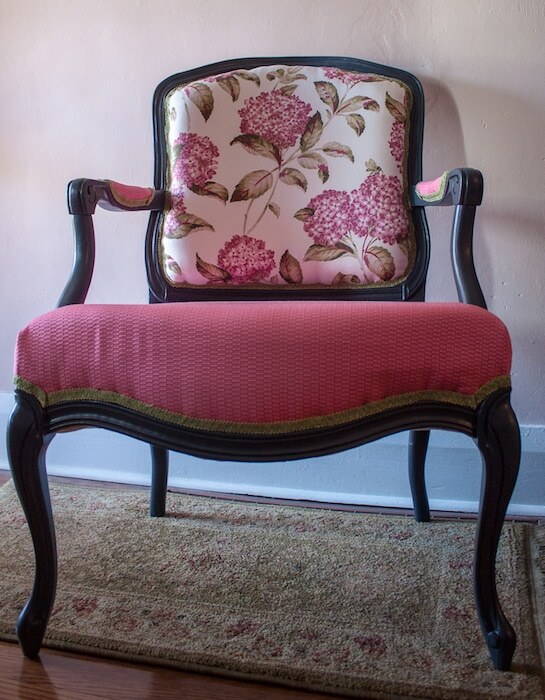 One of the first stumbling blocks to this project was the size of the chair. I could not get it down into our basement, which meant I could only work on it outside or in the kitchen. As you can see in the previous photos, the removing of all the old upholstery and painting happened on our back deck. The rest of the work was done in our kitchen! When I say my entire house is my studio, I am not kidding. 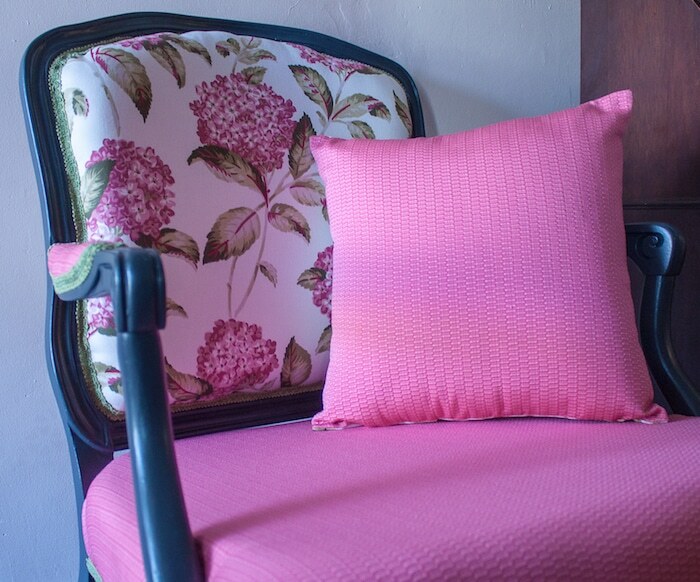 My very first Instagram post was a photo of the fabrics for this project! Did you notice the date? It only took three and half years to complete – May 6, 2015 to December 30, 2018. I may not be speedy, but I am persistent! Finishing this project and another even longer term unfinished project is helping me focus on what I want to achieve in 2019. 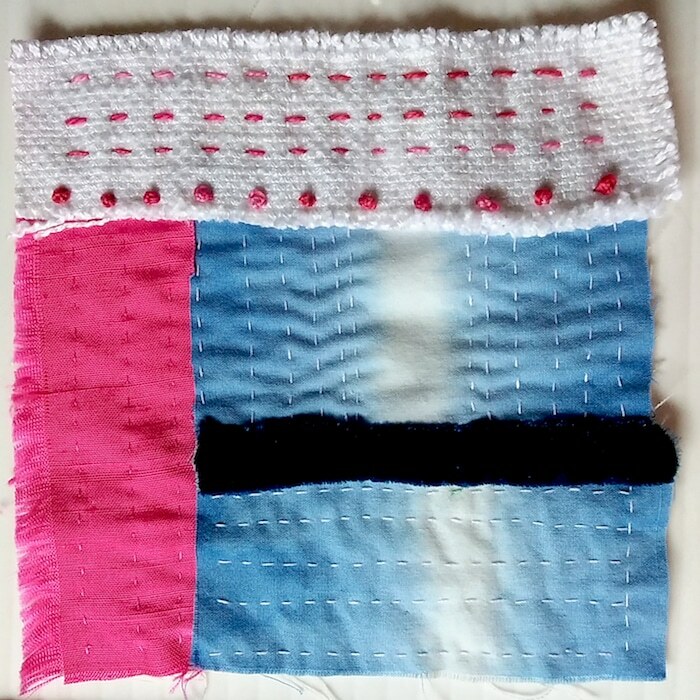 It has freed up space for new projects, including a new series of textile paintings, and the 100 Day Stitch Meditation Project. How have you prepared for 2019? 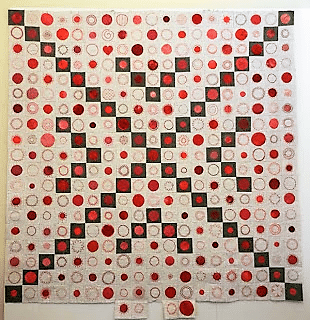 The Fergus Pod of SAQA issued a challenge to create a quilted artwork based on the workds piece/peace. I created: Walking in Peace, a log cabin with spiral insert. 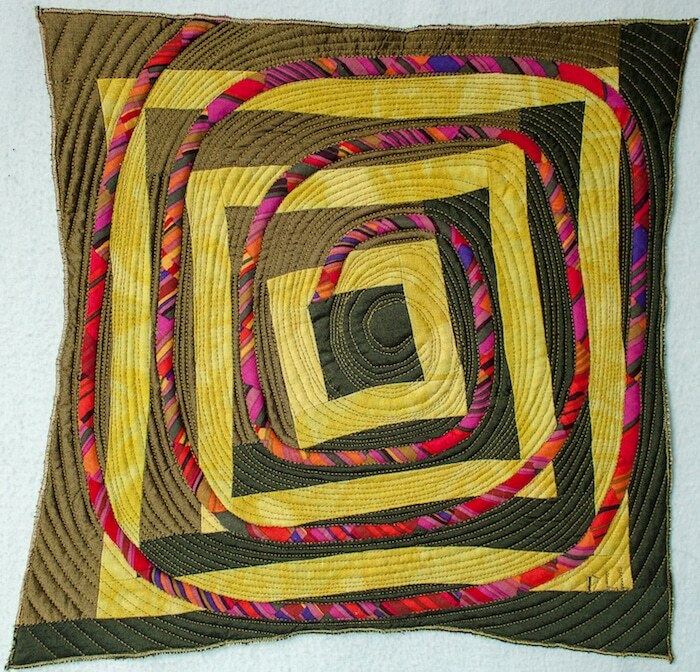 Oakshott cottons, hand dyed linen and a Kaffe Fassett print are combined to make this 12″ x 12″ art quilt. 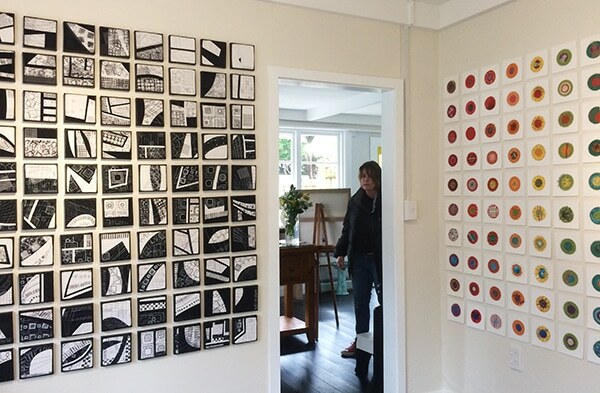 I have been experimenting with inserting strips into my work. I love the challenge of cutting into completed tops! Each turn of the spiral slightly distorts the log cabin block. 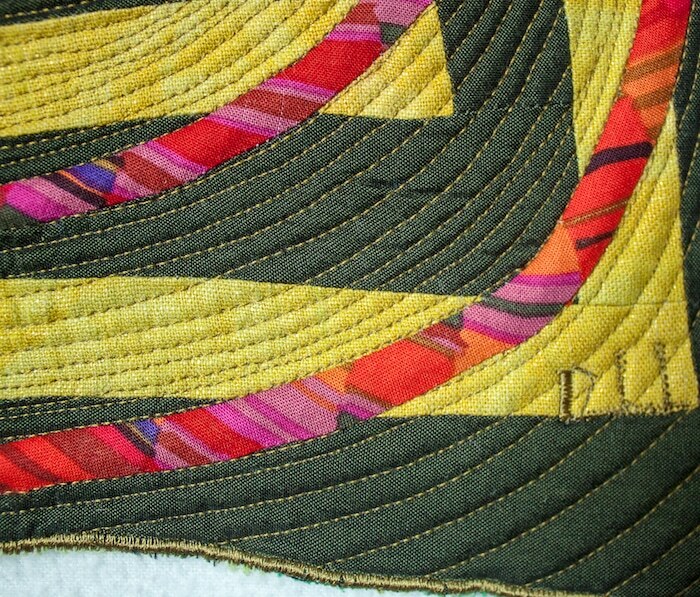 Once the quilt was completed, I struggled finding a title for it. One of the members at the meeting suggested the title: Walking in Peace. The green various shades of green reminded me of a garden maze and the bright spiral the practice of a walking meditation through the garden. How do you name your artwork? 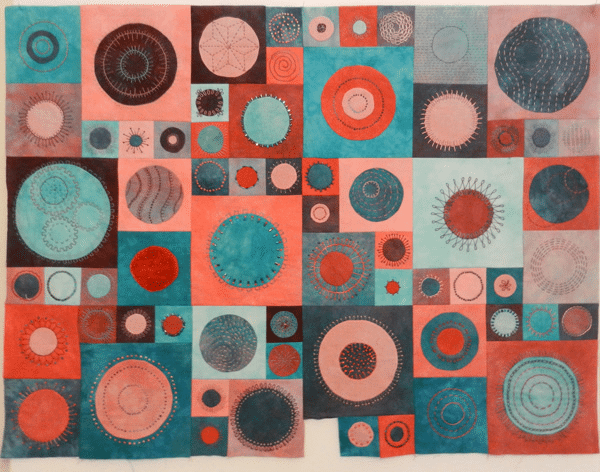 Set of five of my Chakra series of quilts is available in my shop. These all occasion cards are blank inside and come with envelope. 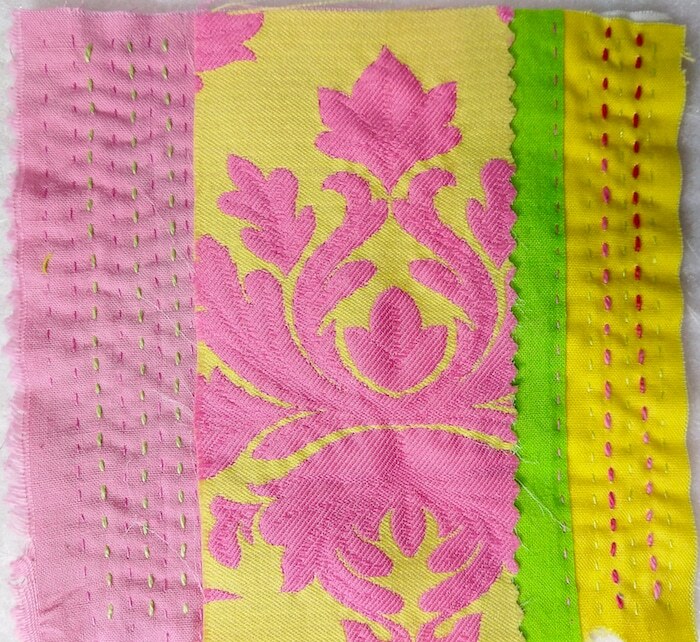 They are printed on glossy paper that show the beautiful colour of the original quilts. On the back of each card is the title, the medium and size of the original artwork. 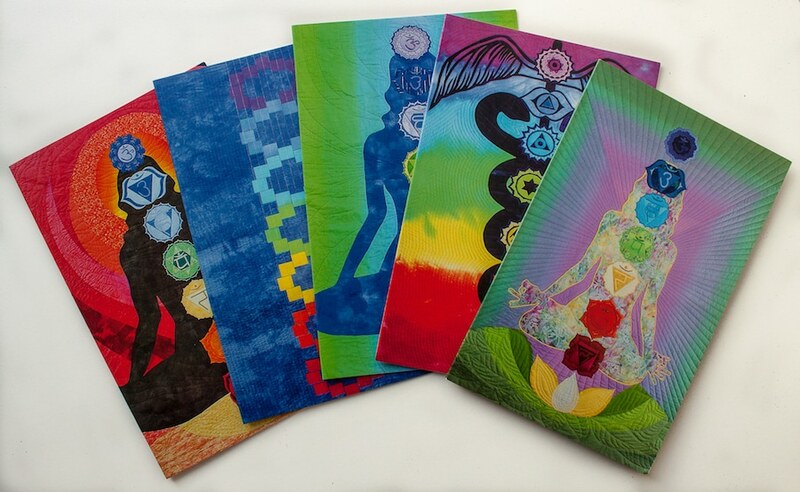 These greeting cards would make a wonderful gift for the holistic seeker, yogi or quilt lover in your life. 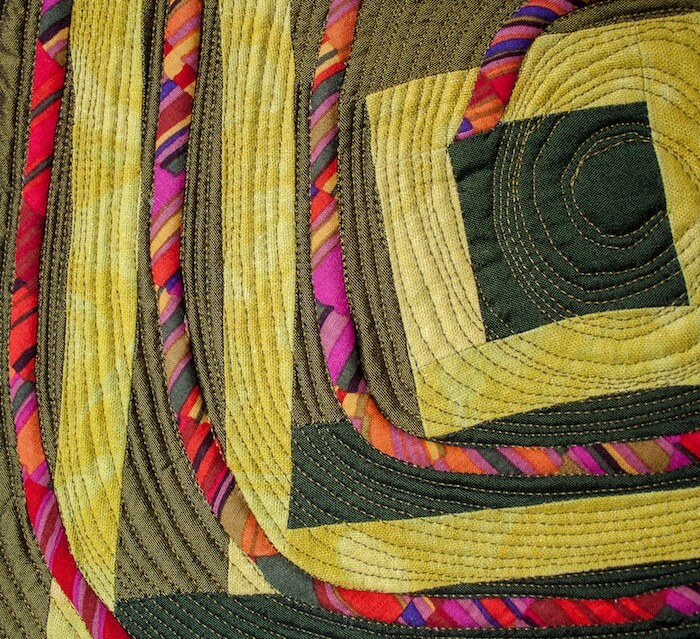 Individual fine art photo mount cards of these Chakra Quilts are also available individually in my shop. 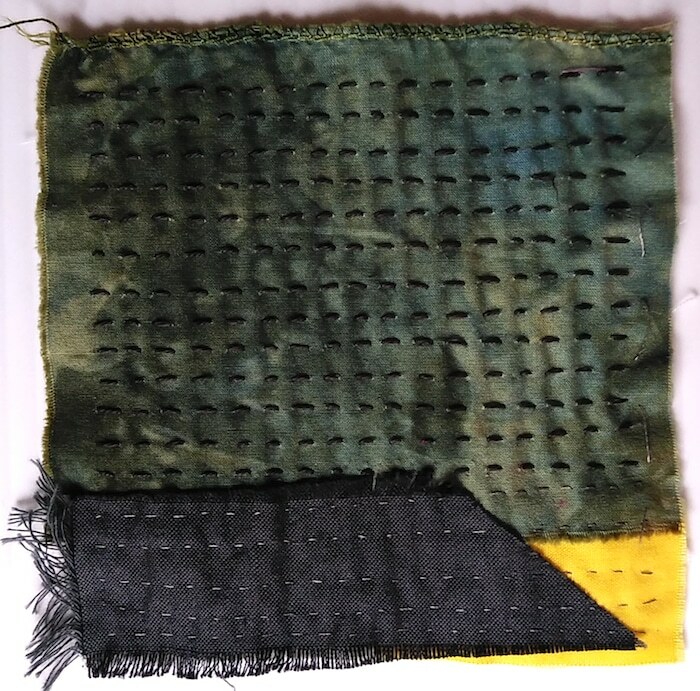 So many factors of the dyeing process contribute to making each scarf unique: fibre content, dye colours, amount of snow used, amount of dye used and folding techniques. Every time I hand dye, I am surprised and happy with the results. Even so, there is always one from each small batch that captures my heart! I’ve chosen a few of my favorite snow dyed shibori scarves that still remain in my shop. Sign up for my newsletter to receive: The Handmade Holiday Gift Guide For Your Favorite Personality.